I am out of the hospital and home as of yesterday morning. The ride home took a lot out of me, so I spent the day largely horizontal and quiescent. So far my recovery has been much ahead of the expected pace, but I’m still very weak and in a lot of pain. Eschewing the opiates has been much better for my digestion and my cognition, but I’m living a lot more closely with my post-operative distress than I have in the past. Slept well last night, relatively speaking. I have two sleeping positions now, neither of them natural or comfortable for me. So I assume one and sleep until the pain and discomfort awaken me, then I assume the other and sleep until the pain and discomfort awaken me. Lather, rinse, repeat. Still managed a good night’s sleep for the first time since leaving Readercon. This morning I tried to follow my routine as much as possible. That is, awaken, exercise, shower, blog. To my own amazement I managed 30 minutes on the recumbent bike. Getting into the shower, I took a look at my corpus non delecti. I am a real shipwreck. What all those scars say to me is that I still live. But they are decidedly a map of pain and suffering as well, of hopes and fears and psychic damage. I still have a lot of fear, albeit not boiling at the surface. The one surprise in my surgery was that the liver tumor had begun to interpenetrate with the abdominal wall. They did some unplanned resecting to deal with that, and the margins were clean. But I’ve heard about clean margins before, and continue to metastasize. I’d like to live to be old. For now, I’ll settle for living today. Photo © 2011, Joseph E. Lake, Jr.
Jay, the beauty of you is in your determination, your honesty and your willingness to share a life led. We all collect scars; in some ways you’re lucky that the big ones are on the outside. You were much missed this weekend, Jay. I am glad to see you up and about, and hope you’re feeling much better than expected. You’re a braver person than I am. 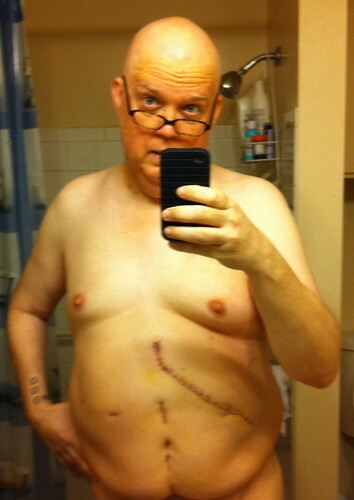 The last surgery I had, which left a vertical scar across my gut, was so hard for me to look at that I would only look at it while looking in a mirror. Four years later, it’s just a funny scar and I’m used to it. I do think opiates for a day or two after surgery are mandatory, but, you’re absolutely right that the sooner you get off them, the better. Hope you’re doing well enough to travel next month!